Upgrade your thermostat. There is no shortage of thermostats on the market today, although that can make finding the right one more difficult. If you’re still using an old manual thermostat or even just a basic digital model, then you may want to consider an upgrade. A wifi thermostat will give you full control over your heating and cooling system, even when you’re not there. This will reduce the load on the system when you don’t need the system as much. Zone your home. If you currently have a large living space and only one temperature for all of it, then you’re probably wasting energy. There’s no reason to keep that guest bedroom the same temperature as your kitchen or living room if it’s unoccupied. Moreover, you will be placing undue strain on your heating system without zone control. We can install electronically controlled dampers within your HVAC system to ensure that you have full customization over your entire indoor climate. Consider a whole-house humidifier. This is not exactly a heating system upgrade, but it will certainly keep you comfortable this winter. Dry air can be a real pain as it often leads to sore throats, skin irritation, and dried out mucous membranes. This will ensure that the hot air delivered throughout your home feels good. 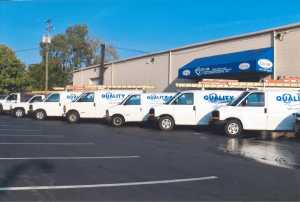 Contact Quality Air Heating and Air Conditioning today to learn more about our heating system upgrades, as well as for any heating repair or maintenance needs in the greater Columbus, OH area.